We were all brought up to know what the American Dream is. You own a big house with a yard, and a nice car, and everyone knows how successful you are. You work 5 days a week to pay your 30 year mortgage, then on the weekends you do yard work, home improvement projects, clean your big house, do laundry and go grocery shopping. But when do you relax and enjoy nature, your children, and your hobbies? And what is the true cost to the environment? The average American home uses ¾ of an acre of forest to build, and produces approximately 7 tons of construction waste. Each year this average American home emits 18 tons of greenhouse gases. The average American house gives off more carbon dioxide than the average American car! Most Americans live a life of drudgery to pay for their large houses. These homes are often just a false show of success. Minimum size housing standards were implemented for the purpose of preserving a “high quality of living.” The actual effect of these laws has been to eliminate housing options for low income Americans. Countless attempts to design and build shelter for the homeless have been thwarted by these building codes. There is a housing crisis in the USA. The Bureau of the Census states that more than 40 % of families in the USA cannot afford to buy a house. Zoning laws have been determining the size of houses, yards and streets for decades. After World War II, the suburbs were invented as a means of dispersing the urban population. During the Cold War, the American Association of State Highway Transportation Officials pushed hard for streets wide enough evacuate and clean-up after a nuclear crisis. Also Fire Departments demanded wider streets for larger trucks. The result was suburban sprawl. The large distances between home and offices, shopping, and restaurants means that now car ownership is required. This results in more gasoline usage and automobile pollution. Lawsuits over the constitutionality of minimum size standards have forced some cities to drop these restrictions. Where this has happened little houses have begun to pop up, and they are selling quickly. In our society which is obsessed with over-consumption, embracing less and living simply is countercultural. Magazines, TV, and billboards claim that the cure for what ails us is earning and spending more money, and increasing square footage. Simplification means that we stop following the herd, and have the courage to take the road less traveled. 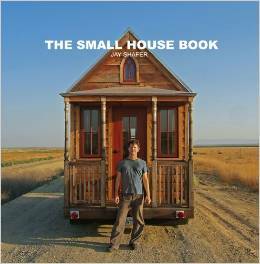 We have this book, it was one that change our minds to head towards the Tiny House. There are exactly what we need because of our declining health and age. I am reading as to learn how to set up a blog…never done one.